Ryan Harris took three wickets in his return to competitive cricket after a two-month layoff with a hamstring niggle, but it was not enough to prevent a two-wicket defeat to Tasmania in Sydney. Queensland, put into bat, started well with a 56-run stand for the first wicket. Once Chris Hartley was dismissed, Usman Khawaja and Greg Moller combined to put on 60 for the second wicket, putting Queensland in a decent position by the 29th over. 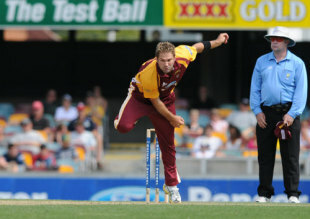 However, Evan Gulbis struck in the middle overs, as Queensland lost five wickets in the space of 63 runs. But No 9, Michael Neser, hit a useful 20 off 16 to see Queensland finish at 241 for 9. Gulbis was the pick of the Tasmania bowlers with 4 for 36. Tasmania also made a solid start to their innings with a 42-run stand, but the chase wobbled when Alex Doolan and Ed Cowan, the No 3, lost their wickets in consecutive overs with the score reading 72 for 3 in the 20th over. Tim Paine, the wicket-keeper captain, and Jordan Silk limited any more damage with a consummate 111-run partnership. The threatening stand was broken by Michael Neser, but Tasmania still had the upper hand with 59 runs required off 46 deliveries with six wickets in hand. However, Neser and Harris then upped the ante and sent four more batsmen back in the next 28 balls, leaving Tasmania tottering on 212 for 8 with only three overs left in the innings. Enter Clive Rose. The No 8 smashed 23 runs off nine deliveries to help Tasmania overhaul the target with five balls to spare, taking Tasmania to second place in the Ryobi Cup points table.